There has been a recent storm brewing against coffee, saying that caffeine can affect your sugar levels and that it can give you diabetes. What does SuperFoodsRx think about the connection between coffee and diabetes? Like everything on this site, it’s science based. Studies have shown that caffeine causes a brief reduction in glucose tolerance shortly after consumption. Glucose tolerance is the body’s ability to control blood sugar levels after the ingestion of sugar. When you eat a meal with sugar, carbohydrates, or starch, the stomach breaks down these materials to glucose. Glucose is a simple sugar that can be absorbed and used by the body. After the sugar is absorbed it circulates in the bloodstream. High levels of glucose (sugar) in the blood can cause damage to blood vessels, so the sugar must be stored for later use. The hormone insulin is released by the pancreas to lower the sugar levels in the blood by storing it in the liver and fat cells. A reduction in glucose tolerance would mean the body was not responding appropriately to high sugar levels in the bloodstream. Diabetes is an extreme case of reduced glucose tolerance in which the body cannot lower sugar levels without medications or insulin shots. Many physicians, including myself, consider impaired glucose tolerance a form of pre-diabetes that may become diabetes. How does this tie to coffee? Once researchers saw that caffeine briefly reduced glucose tolerance, they tried to prove that coffee caused diabetes. What they found surprised everyone! 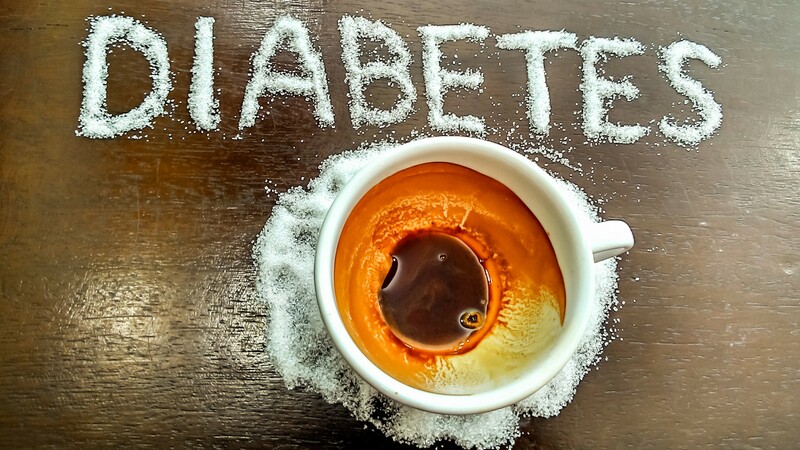 Studies over the past five years have shown that drinking caffeinated or decaffeinated coffee can actually reduce the risk of developing diabetes. Some of the studies attributed the decreased risk of diabetes in participants to weight loss which occurred during the studies. Other studies proposed a difference between the caffeine in coffee and that in caffeine supplements. Ultimately, we still don’t know why, but something in coffee actually lowers the risk of diabetes. Since decaffeinated coffee is also associated with lower risk of developing diabetes, it is likely that phytonutrients in the coffee are preventing the development of diabetes. Coffee contains plant antioxidants and, for many, it is the only source of antioxidants in their day. Coffee drinking has also been associated with a lower risk of developing gout and Parkinson’s disease. However, recommendations for optimal coffee intake have not been established. Once again, I would like to call for moderation. One to two, eight-ounce cups of coffee a day is reasonable. I recommend decaffeinated coffee because caffeine can raise blood pressure, and that can lead to heart disease, stroke, and kidney disease. Remember, more is not always better — a study in the Netherlands found an increased risk of developing bladder cancer in men who drank more than seven cups of coffee a day. As a side note, I’d like to add that tea has a higher antioxidant concentration than coffee. Furthermore, tea consumption has been associated with lower risks for developing many cancers and inflammatory conditions. While coffee is okay, tea is better.